Most coverage of opinion polls published in the last week has made one thing clear: Support for a Brexit is growing and Remain voters should be seriously worried. This is sort-of-true. There is little doubt that public opinion is shifting in the direction of a Brexit. 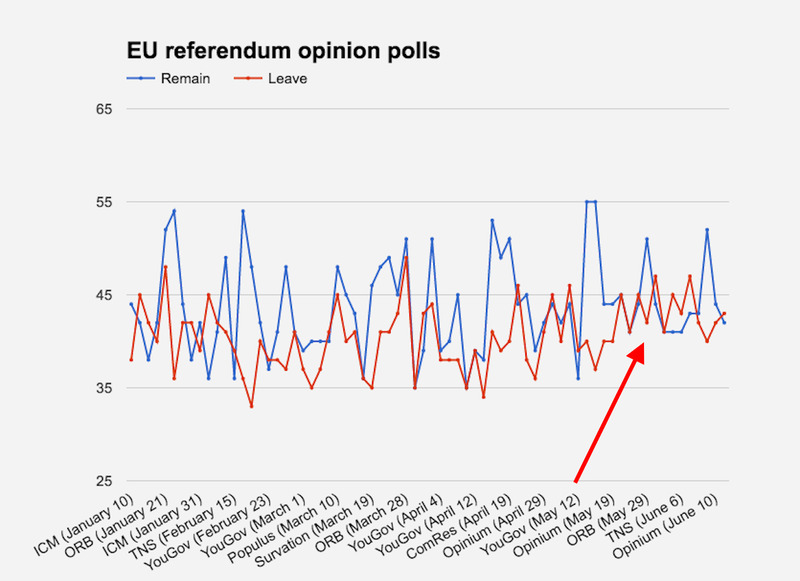 Just a month ago, polls were indicating really comfortable leads for Remain — especially phone polls. At one stage it looked like David Cameron and the Remain campaign were on course to a convincing victory. However, the tide has turned. According to polls published over the weekend, Remain has surrendered its commanding position and now the rival campaigns are effectively neck-and-neck with June 23 approaching. 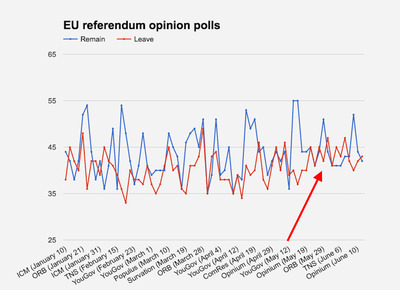 Business Insider’s chart below illustrates how public support for Leave has steadily increased since mid-May. What should be just as alarming for Remain is that pro-EU voters are not as motivated as they need them to be, either. An ORB survey published earlier this month revealed that just over half (54%) of people who intended to vote Remain said that they were certain to vote compared to 69% of Leave backers who said the same thing. If the outcome of this referendum really is hanging on a knife-edge, then Remain has absolutely no room for complacency. It’s much more difficult to win a tug of war if your teammates can’t be bothered to pull the rope. But, Remain shouldn’t be declaring a state of emergency. Not yet, anyway. There is no question that it’s in a weaker position than it has enjoyed in the past but pretty much every analyst agrees that Britain voting to continue as an EU member is still the most likely outcome. This is shown in the charts below. They were produced by Citibank and are based on data published by polling analyst Matt Singh who founded the Number Cruncher Politics Blog. Singh’s current live referendum forecast recognises that the odds of a Brexit taking place have improved but the probability of it actually taking place are still just 24%. A major reason for this — and another reason why Remain shouldn’t be losing their minds just yet — is that British history tells us that support for the status quo option almost always increases in the days before a referendum. This was true of the Alternative Vote referendum of 2011, Scottish devolution referendum of 1979, and the two Welsh devolution referendums that took place in 1979 and 1999. In each case, the status quo option polled much better with just days to go until people went out and voted. This is likely to happen because undecided voters and those who have no passion on the matter are likely to opt for the status quo option as it is generally perceived as less of a risk and the more sensible way to vote. Importantly for Remain, as Business Insider highlighted earlier this month, there is evidence showing that the process of undecided voters aligning with Remain is already underway. If Remain finds itself behind in polls released next week then it should really start to panic. Until then, Remain supporters can stay quietly confident in the knowledge that talk of Leave’s rise, so far, has been slightly overstated.